According to The Digital Reader (confirmed by The Wall Street Journal), Barnes and Noble stores are expanding their NOOK areas in retail stores for the holidays, and likely in time for the next generation of NOOK. 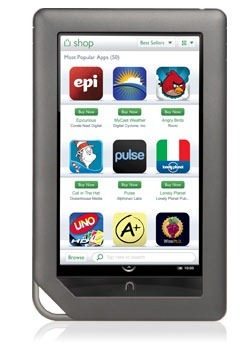 Digital Reader claims that on November 7, B&N will make an announcement regarding the NOOK line of products, and that the expansion of the NOOK Boutique in retail locations is being undertaken to prepare for the arrival of the new Android-powered color eReader. Many have speculated that B&N would unveil a new NOOK before the holiday season here in the U.S., as the NOOK Color has reached a practical end of life when compared to the hardware of its primary competitor, Amazon's Kindle Fire. Now, it seems there is finally some concrete, albeit circumstantial, evidence that B&N is planning something big and NOOK-related. Guess we'll have to wait until November 7th to see how this rumor pans out.